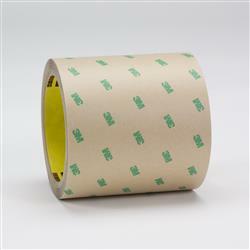 3M(TM) Adhesive Transfer Tape F9465PC is a 9.2 mil, Specialty Acrylic tape on a 4.2 mil, Tan 58# Polycoated Kraft Paper (PCK) liner. Bond high surface energy plastics and metals. Used to bond plasticized vinyl gaskets, decals and moldings. Jaco Aerospace and Industrial is your one stop resource for 3M(TM) Adhesive Transfer Tape F9465PC is a 9.2 mil, Specialty Acrylic tape on a 4.2 mil, Tan 58# Polycoated Kraft Paper (PCK) liner. and all of your 3M Products, Tapes, aerospace and industrial needs.